The election of the pork producer delegate candidates for the 2015 National Pork Producers (Pork Act) Delegate Body will take place at 1:00 pm. Thursday August 13, 2015 in conjunction with a conference call meeting of the Virginia Pork Council Board of Directors meeting. 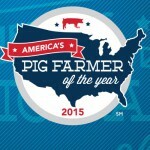 All Virginia pork producers are invited to participate. Any producer age 18 or older, who is a resident of the state and has paid all assessments due may be considered as a delegate candidate and/or participate in the election. For more information please contact the Virginia Pork Council, 1320 North Veitch Street, #1414, Arlington, VA, 22201. Phone: 402-7687-3782 or E-mail: VIRGINIAPORK@verizon.net.